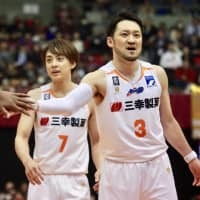 KAWASAKI - Star guards Kei Igarashi and Shinsuke Kashiwagi were reunited this season and are cherishing the opportunity to once again don the same jersey, this time for the Central Division-leading Niigata Albirex BB. They were brought back together when Kashiwagi signed with the Hokuriku team before the 2018-19 season. The two had previously played together for the Hitachi Sunrockers (now known as the B. League’s Sunrockers Shibuya), until Kashiwagi left for the Aisin SeaHorses (presently the SeaHorses Mikawa) after the 2005-06 campaign. Both represented Japan at the 2006 FIBA World Championships, which has since been rebranded as the FIBA World Cup. Kashiwagi said with a smile that it’s been “nothing but fun” sharing the court with Igarashi, with whom he also played at Chuo University. “It’s been 12, 13 years, hasn’t it? 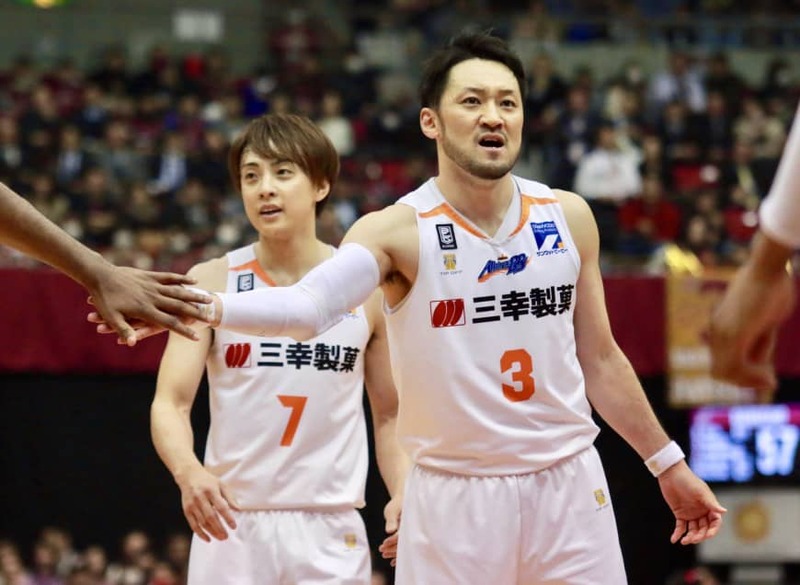 We are playing and having fun, and we’ve been getting better as the season has progressed,” Kashiwagi said after the Albirex’s 71-66 loss to the Kawasaki Brave Thunders at Todoroki Arena on Wednesday night. Led by the veteran combo, Niigata had posted the third-best winning percentage in the 18-team top division (.694) through Wednesday’s games. The Albirex were on a nine-game winning streak until it was snapped by division rival Kawasaki. Despite a long time spent apart, Igarashi and Kashiwagi, aged 38 and 37, respectively, said their close relationship hasn’t changed a bit. Though both are point guards, Albirex head coach Kazuhiro Shoji has used them as starters in most of the team’s games so far. Neither Igarashi (36 starts) nor Kashiwagi (33) have begun any of their games on the bench. Shoji said that he has relied on his two veterans simply because it gives the team the best chance to win. Igarashi, who has contributed 11.9 points and 5.3 assists (fifth in the league) per game this year, said that he doesn’t need words to communicate with Kashiwagi on the court, which it has made it “easier” for him to play. Kashiwagi had played as a backup point guard over the last few years for the SeaHorses and Nagoya Diamond Dolphins, for whom he played last season. But in Niigata, he has been utilized as a combo guard, playing at both the one- and two-guard spots. The Hokkaido native averaged less than 15 minutes per game in his previous three seasons, but has been on the floor for 28.1 minutes per contest this year. Shoji has also tried to have either Igarashi or Kashiwagi on the court at all times to help the team maintain its composure. Meanwhile, Igarashi hopes Kashiwagi brings what the team had missed to the table with his abundant experience, including his big-stage accomplishments. While Igarashi has not won any titles professionally, Kashiwagi has captured three Japan Basketball League and four All-Japan Championship titles. Kashiwagi was also the JBL MVP in the 2007-08 season. The Albirex missed the postseason with a 28-32 record last year, so the addition of Kashiwagi has certainly been an upgrade for the squad. But Igarashi and Kashiwagi both stressed that their team isn’t a powerhouse and would keep playing with a challenger’s mentality to reach the playoffs.